I’m a certified sucker for fresh bread. As you know if you’ve ever woken up on a crisp morning here at The Muddy Kitchen, there is always a freshly baked loaf of bread on the counter by the windowsill. I can think of nothing better, nothing closer to perfection, nothing more humble yet more tempting and satisfying than fresh artisan-style bread slathered with my big, fat, homemade butter. I started baking bread in college when I did the math and realized how much cheaper bread was to make yourself than buy in the store. I plowed through recipes, pumping out piping hot loaves of whole grain, rye, wheat, mostly dense, chewy stuff that could be counted as a whole meal unto itself. 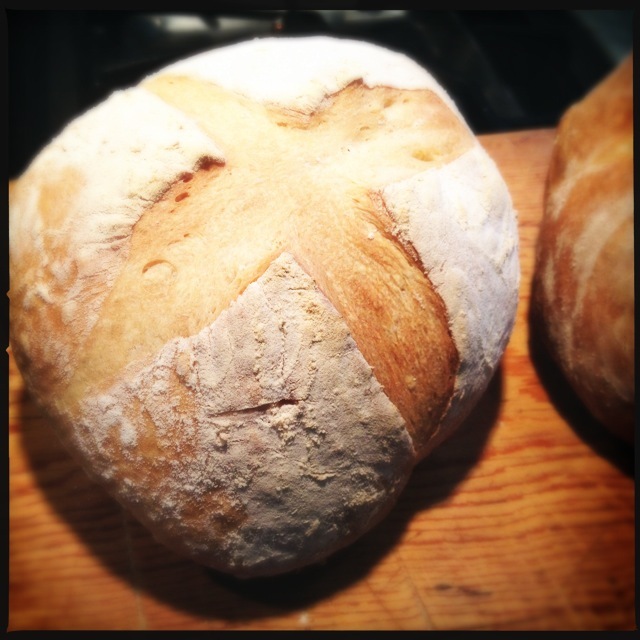 As I got older and my tastes more serious, I took a hard knocks course in sourdough and began obsessing over the stuff. But making sourdough bread is a little like birthing a child; it takes planning, an insane amount of forethought, occasional moaning and groaning, it’s messier than you’d expect, but in the end it’s nice to look at the yummy thing you created and feel genuine love and the pride of accomplishment. But I’m older and wiser now and my kids are messy unto themselves and practically driving; I’m all about the shortcuts. 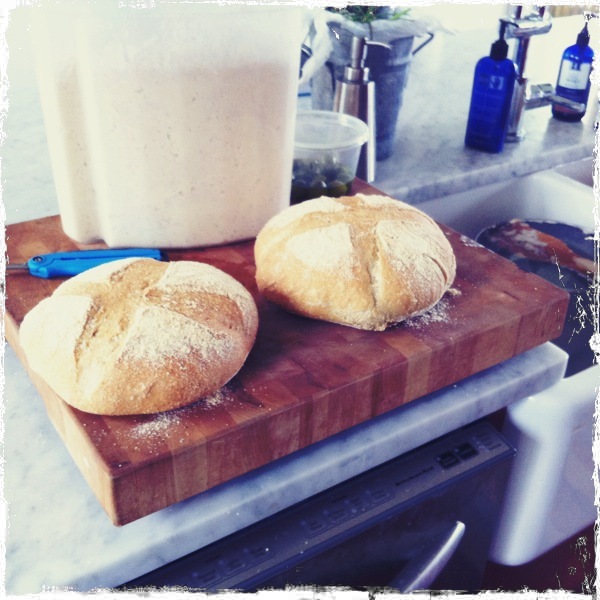 My bread-baking life revolutionized when I discovered Artisan Bread in Five Minutes a Day . It’s a foolproof recipe, relatively mess-free, no kneading required, and it’s as delicious as the sourdough bread I used to make over the course of days. I have botched up the recipe over the years, left it in the stove an hour too long by mistake, let it to rise too much, sit on the counter too short – and I’m telling you, it still makes a great bread! As a bonus, the recipe is easy to memorize; I never have to pull the book out to look anymore. There are tons of recipes in the Artisan Bread book and on their website, but I always come back to this basic one. 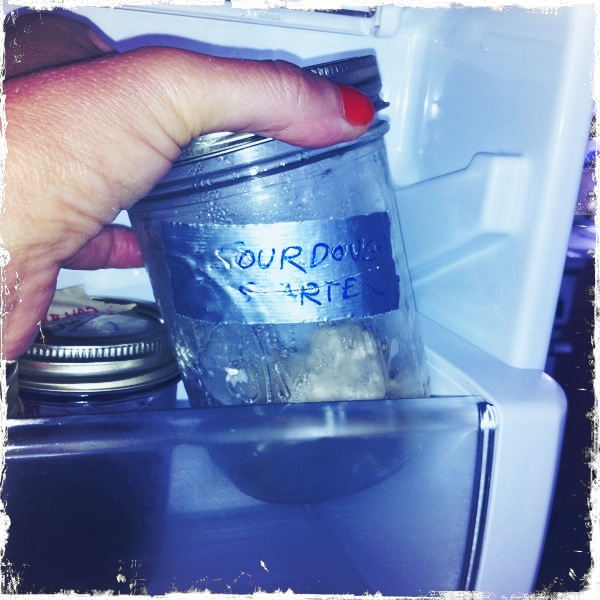 My personal secret to make this bread extra-phenomenal is that I keep an old lump of sourdough starter in a Ball jar the fridge. I don’t ‘feed’ the starter or nurture it in anyway – I just use it for that ‘sour-y’ flavor. I add the tiniest pinch and reduce the amount of yeast to 1 tablespoon. If you’re serious about your delicious bread, I encourage you to go that extra mile just once (my starter has been in the fridge since 2007), and have a batch to pull from. Circa 2007. Smuggled on plane from San Francisco. There is no better book on artisan baking than this one so if you are dying to make your own sourdough starter, buy the book or (*hint, hint) search the term “starter” on the Amazon ‘Look Inside’ page. The whole idea with this recipe is that you’re making a ‘wetter’ batch of dough – almost a dough-batter – in the same container you mixed it in. It hangs out in your fridge until you need it. While this recipe looks long here, it’s super-simple. No muss. No fuss. Just plop it out and bake it. This recipe sumptuously doubles (but you’ll need to buy two containers). 6 ½ cups of All Purpose flour plus more for dusting. In a large, ideally vertical, plastic container (I use a Rubbermaid Cereal Keeper ) add the water, salt and yeast. This is also when I also add a tiny pinch of my own sourdough starter for flavor but your bread will still be delicious without it. Now add in the flour. I always count the cups aloud and give people the “Don’t-interrupt-me-I’m-counting” face. I will sometimes substitute ½ cup of another flour, like whole wheat, if I’m not in the mood for the really ‘white, white bread’ effect of 100% All Purpose flour. Mix. No kneading is required here. 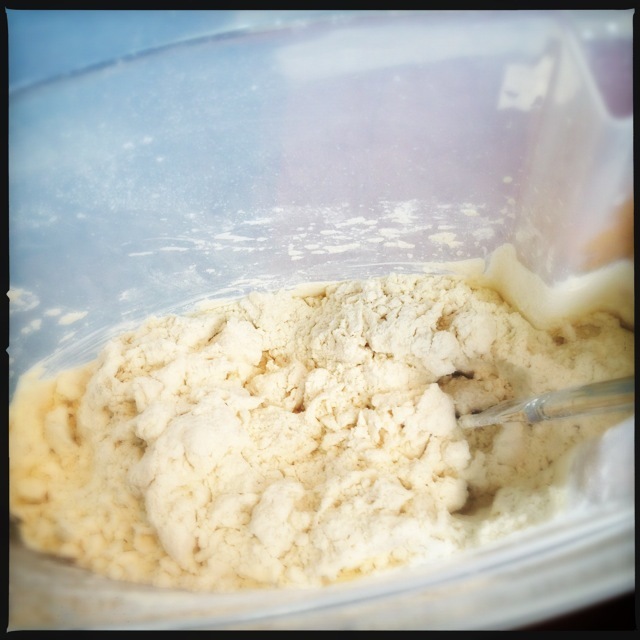 I use a spoon then squish it up with my hand until the dough-batter is evenly moist…or even enough. Washing my hand is the only mess involved. No muss. No fuss. Just plop it out and bake it. Let sit, then store. Cover your Tupperware container with its lid and let the whole thing sit on the counter for a couple hours, 1 – 4, depending on your state of remembering about it. The dough will rise in the container and you’ll see bubbles. Then, when you finally remember you left a thing of dough on the counter (1-4 hours later), stick it in the fridge. Overnight is ideal. A few hours is minimal. 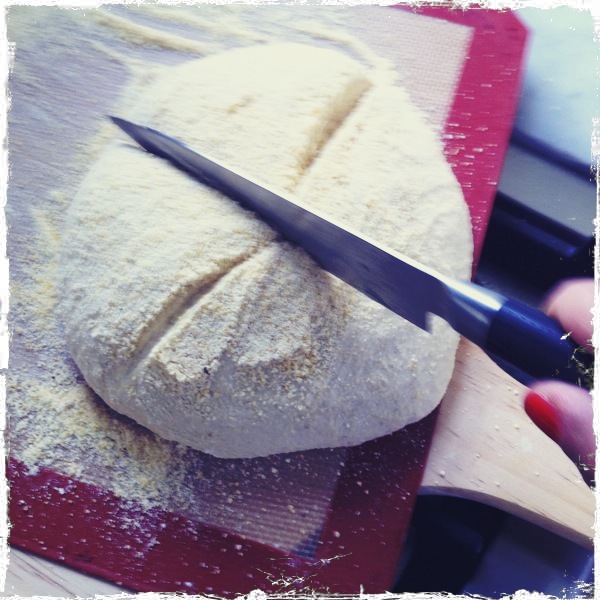 The coldness of the dough is crucial to forming a loaf. If it’s not cold enough, it’ll be too messy and wet to work with. You can leave the dough in the fridge as long as a week, even two, yanking bits off here and there to make your bread. Form the loaf. When your dough is nice n’ chill, dust the surface with a little bit of flour and scoop up a grapefruit-sized chunk of it (about 1/4 or 1/3 of the whole batch) and form it into a nice ball by ‘pulling’ the outside edges around and pinching it together at the bottom. You can form the ball anyway you want but the ‘pulling a blanket over the ball’ motion just helps to make that ‘artisan bread-ish’ look about the final product. Just try it and you’ll know what I mean. Slash and bake. When you finally remember about the raw loaf sitting in the kitchen, turn your oven to 450° and dust the top of the ball with a bit of flour and make a slice or two – or carve your initials – on top with your sharpest knife. This is the step that really gives it that quintessential artisan look. Put the whole cookie sheet + dough into the oven, or if you’re really cheeky, shove it onto the preheated pizza stone you keep in the oven for events such as this. It all comes down to this: the final dough slash. In 40 minutes your bread will be done. Saying that, I’ve impatiently taken it out after 30 and mistakenly left it in for 90 without a problem. 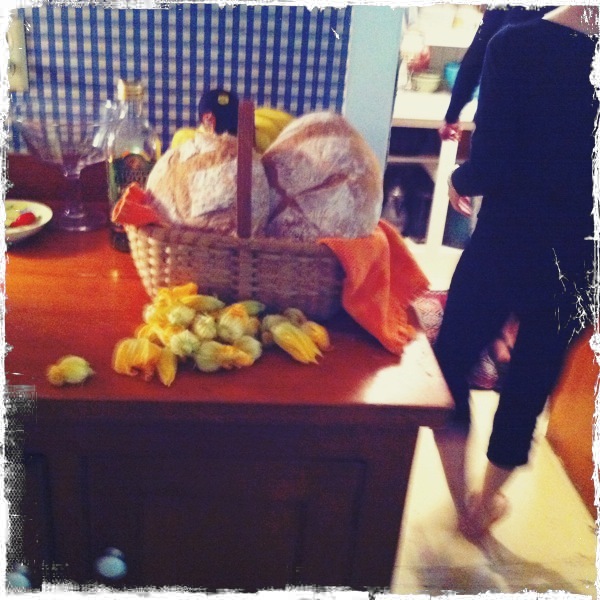 Cheaper than even a bottle of Vinho Verde, a basket of fresh-baked bread makes a great dinner gift. Man, that looks good… My mouth was watering just reading that! Thanks, Jordan! I’ve got some made in the Muddy Kitchen right now if you want to dash on over! I can attest to being addicted to Jennifer’s artisan bread—-better than Bubbe Soodik’s challah. I have been thinking that I need to learn how to make a good loaf of bread! Can’t wait to try this out!!! I’ll let you know how we do. English muffins sound great too. I’m totally inspired now 🙂 Thank you! I haven’t made bread in forever. Maybe I need to pull out my baking supplies. Give it a try. You don’t really need much in the way of supplies. Just the very minimal: flour, yeast, water, and a big Tupperware thingy. Does the yeast need to be proofed first? Nope – just swish it around in the ‘bathtub’ warm water. Ha! That’s what I meant! Nothing I love better than a nice yeasty bathtub! Great for your skin and, you know, your ‘pirate’ parts.